Growing up in rural Western Pennsylvania my parents instilled in me many values and characteristics that I am very proud of today. I moved to Eastern Pennsylvania over twenty years ago and have met and worked for hundreds of Landowners across rural Pennsylvania. Kindness, loyalty and the trust that a person’s word serves as their bond are qualities shared throughout the state. When a farmer agrees in a conversation to sell 250 bales of hay out of the field for $500, both parties have “given their word” and the deal is done. These gentlemen do not need written contracts with attorneys. However, many Landowners have unfortunately learned the hard way that handshake agreements are a thing of the past when dealing with natural gas and pipeline companies. Oil and gas industry is big business and involves complex and powerful agreements that must be negotiated to benefit the Landowner. Despite how agreements are presented with a smile, Landowners can never forget that oil and gas contract negotiations are adversarial and the smiling Landman works for the company, not you. Remember, natural gas and pipeline companies have secured Oil and Gas Leases, Pipeline Right‐of‐Way Agreements, and many other oil and gas contracts across the country for over 100 years. The gas companies and their Landmen have extensive experience dealing with rural Landowners. The company Landman understands how Landowner’s admirable character traits may be used to the company’s advantage during the negotiation process. Traits like kindness, loyalty and trust are manipulated in the negotiation process to secure the most favorable agreement for the gas or pipeline company. Far too often Landowners tell me that the Landman is “a really nice guy” and that they have reservations in asking for certain terms or higher compensation as they do not want to rock the boat. I have even heard of occasions when the Landman told the Landowner that he or she would “lose their job” if they could not get the Landowner to sign Oil and Gas Lease, Pipeline Agreement, or other Marcellus Shale or Utica Shale contract. This is an extreme example, but Landowners should never make any decision to enter into an agreement with a gas or pipeline company for any other reason than it is in the Landowner’s best interest. Since “guilt negotiation” tactics do not always work, you may hear the Landman or company shift to a “fear tactic negotiations”. One common fear tactic is the Landman or company telling a Landowner that if the Landowner does not sign the offer presented, the company will simply operate under their existing gas lease and the Landowner will receive little to know compensation for the planned activity. I see this often when Landowners are presented with Pipeline Right‐of‐Way Agreements and Roadway Agreements. If the Landman uses this tactic, you must not simply take their word as true. Many times this statement is absolutely not true. Remember, who the Landman works for – not you. If you are presented with this situation you must contact experienced legal counsel to evaluate your circumstances and advise you of your options and negotiation leverage. Another common fear tactic is when a Landman tells the Landowner that “we will just work around you” or “we will just take your gas from your neighbor’s property” if you do not sign a presented oil and gas lease, lease amendment and modification or other similar agreement. These are very serious statements, especially the statement that the company will exclude you from production if you do not sign the presented document. You cannot take this statement at face value, but you cannot ignore this serious statement. Again, you need to contact experienced legal counsel to evaluate whether these statements are true and to understand your options and leverage. Landowners should not enter into oil and gas agreements out of guilt or fear. Landowners should reach agreements because they are fully informed and feel that the agreement is in their personal and family’s best interest. Just as the gas or pipeline company will always act in their best interest, so should the Landowner. Landowners must not to allow Landmen to use the Landowner’s admirable character traits to their disadvantage during the negotiation process. Since 2007 I have seen many Landmen and company representatives come and go. Many Landmen that I worked with years ago are now working for different gas or pipeline companies in Pennsylvania and other states. I always enjoy the opportunity to question these Landmen about how a few years ago they told me Company A was “the best” and “committed to the Landowner,” and now apparently Company B is suddenly “the best company they have ever worked for” and they are shocked how Company B is “dedicated to Landowner fairness and protecting the environment.” Think about that. The transient nature of the Landman position is a clear indication that their ultimate job is to “get signatures” and move on to the next Landowner. I have developed many positive relationships with Landmen over the years and many are truly nice people. However, they have a job and they must produce signatures. At the same time you have the job of protecting your family and land for generations. or any other Marcellus Shale contract. Remember, gas and pipeline companies are loyal to shareholders and profits. You must do what is best for you, your family, and your land. Our family owns land in Susquehanna County. Attorney Doug Clark represented us in oil and gas lease and pipeline right-a-way negotiations with Carrizo. Attorney Clark was very knowledgeable and a great asset to have on our side during negotiations. He was very responsive to our questions via email or phone which is a trait we have not always seen with other attorney’s and was appreciated greatly. 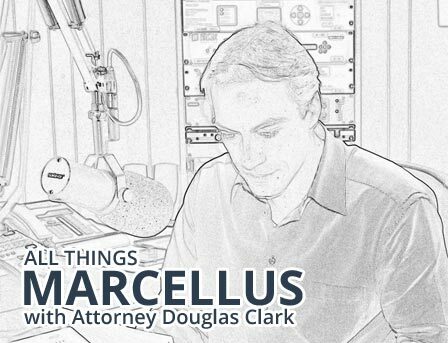 Our worries and stress were greatly relieved by engaging Attorney Doug Clark in our negotiations. Every aspect was handled timely and smoothly. In addition Attorney Clark represented us in another legal matter involving representation in a court case. He was very prepared and clearly outshined the other Attorney’s involved. Due to his efforts the outcome was positive for us.